Although slightly higher than we figured it would be, we had this contest pegged at -14.5 ATS, the huge Houston Texans at New England Patriots odds are not a surprise. Several factors illustrate that the large -16 point spread is a reasonable line. First, the Patriots rolled to a 27-0 home win over the Texans back in Week 3 with rookie QB Jacoby Brissett under center – not Tom Brady who was serving his ridiculous “Deflategate” suspension. No strangers to big lines, New England was a -14 point favorite against Denver in the 2012 Divisional Playoffs and the Pats blasted the Broncos 45-10 in Foxborough. Mad scientist Bill Belichick and his coaching staff, plus home field advantage and Brady still being in FU mode, also helps tilt the scales in favour of a Patriots romp in this rematch. During the Belichick & Brady era, a 16 year span dating back to the 2001 NFL season, the Patriots have played in twelve second round playoff games and have posted a 10-2 record. New England has won five straight AFC Divisional matches, all at home and by a combined 191-111 margin, including a 41-28 humbling of Houston in 2013. The last two contests were close as the Patriots won 27-20 vs Kansas City last year and 35-31 vs Baltimore in 2015. Apart from RB LaGarrette Blount sitting out practice with an illness this week – the Pats are hot, healthy and ready to go. Houston heads into Gillette Stadium with some very heavy baggage as the Texans are 0-4 overall in Foxborough (1-7 all time vs Pats) and were outscored by a 150-49 margin (37.2 to 12.3 average) in those contests. After being benched in Week 15 and 16, QB Brock Osweiler is back under center for a third straight contest. Thought to be the final piece of the puzzle in Houston, when he came over from Denver during the offseason, Osweiler has been a bust as is evident by his 16:16 TD/INT ratio. RB Lamar Miller posting a massive effort is the Texans best hope of keeping this contest close. It is the second week of January and a rested Patriots Crew is back in the playoffs – so what else is new eh? Although not against the best talent, New England closed their season on a 7-0 run that included 41-3 and 35-14 wins against the Jets and Dolphins respectively. Houston closed with a 3-4 mark but, as we predicted, they humbled the injury riddled Raiders 27-14 at home during their Wild Card game last week. However, that contest is not a fair barometer of the Texans talent level. Osweiler was asked to “manage” that matchup and the Texans statistically top ranked defense smothered the Oakland offense who were missing stud QB Derek Carr. Houston’s Top D rating is based on yards allowed but the Patriots owned a better scoring defense as they allowed 15.6 PPG compared to the Texans 20.5 PPG. The better team, with home field advantage and a playoff savvy coaching staff, is getting our support here. Projecting a 34-10 final score, we are laying the monster -16 (-110) SportsInteraction ATS price and calling for the NE Patriots to bag a blowout win. As we continue to celebrate a New Year, NFL playoff 2017 betting tips are more plentiful than ever. Whether bettors search them out on the internet, or pay the price for a tipping service, one of our primary tips is to know the source of information and be sure it's reputable. Here at Canada Sports Betting, we are proud of our free service as our dedicated team works hard to bring our readers the best tips possible. In addition to our Texans vs Patriots free pick, we have also posted a prediction on the Seahawks vs Falcons early Saturday match that is slated 4:35 PM ET at the Georgia Dome. The Kansas City Chiefs vs Pittsburgh Steelers game at 1:05 PM ET, plus the Green Bay Packers vs Dallas Cowboys contest at 4:40 PM ET on Sunday, January 15, 2017, will decide the final two NFL Championship Sunday squads. Stick with us all the way up to Super Bowl LI on February 5, 2017. Being as the prices are only going to get smaller moving forward – bettors are advised to get their NFL Super Bowl futures wagers placed as soon possible. As our table above illustrates, New England and Houston are at opposite ends of the spectrum when it comes to NFL Championship odds. The Patriots, as +150 ML favorites to claim the Vince Lombardi Trophy in 2017, have been on top of the SportsInteraction futures board for months. The Texans having to get past the Brady Bunch, on the road in New England no less, has pushed their line to +6600 which is actually higher than the +5000 price they were tagged with prior to their Wild Card win over Oakland. While we can not advocate Houston, with even the smallest wager, bettors backing New England right now will have a decent hedge opportunity if the Pats play on Super Bowl Sunday as their NFC opponents will be underdogs. 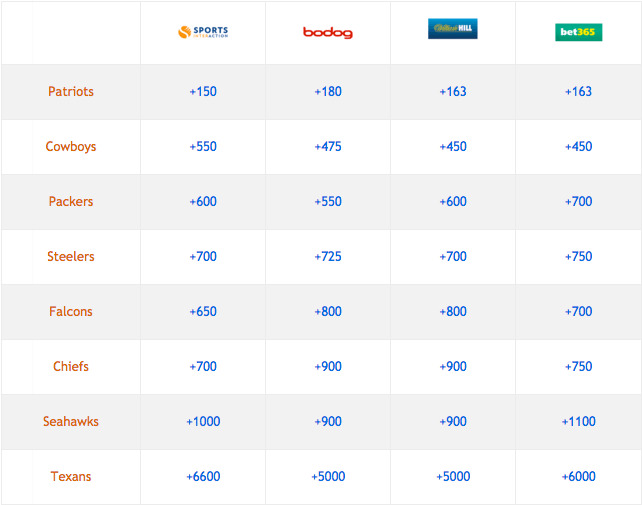 Check in on game day as LIVE scores and odds are available via our widget below.